Cork County Council Chief Executive, Mr Tim Lucey said “Cork County Council through our Economic Development Fund is delighted to be a Platinum Sponsor of Volvo Cork Week 2018. I wish to congratulate The Royal Cork Yacht Club on organising this biennial sailing regatta based around Crosshaven and Cork harbour. The strength and appeal of the Cork tourism offering is significant and this event provides an excellent opportunity to highlight what Cork has to offer. Mayor of the County of Cork Cllr. Patrick Gerard Murphy said “ I wish The Royal Cork Yacht Club every success for Volvo Cork Week 2018 and I look forward to attending events during the week. 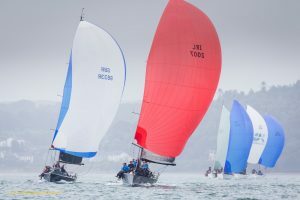 Volvo Cork Week has cemented its reputation as a world class sailing experience and this can be seen in the number of entries to this year’s event. I would like to welcome all the visiting participants, families, and supporters to our great county and commend you all for the hard work, passion and dedication that has brought them here. While this is a competition, I wish to remind all participants, families and supporters to take some time to enjoy all that is “Pure Cork”. “The Volvo brand is evolving in Ireland and globally. Volvo have a strong heritage in designing stylish and dynamic SUVs offering the latest in technology and safety. The new XC40 is no exception. It’s the perfect car for an active lifestyle and our new range of cars will be on display at the regatta. May wind and sunshine continue, to delivery the racing conditions that this wonderful event deserves. Volvo wishes all competitors good luck for an enjoyable event on land and at sea in Crosshaven at Volvo Cork Week.” – David Thomas, Managing Director, Volvo Car Ireland.